Whist not the best game on here in a traditional sense I did share this game with more people than any other game in the jam. Dark and crude. Good job. Fun game mechanic, controversial theme. It has it all! 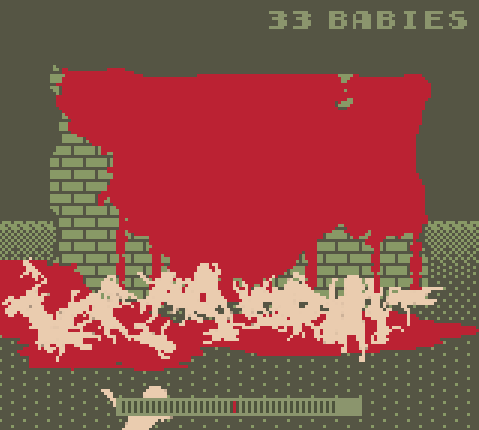 Trivia fact: once I made a game about a baby eater for a Ludum Dare, but it was far more cartoony than this one. Obviously for shock value and not that funny of a joke but still an interesting departure from the standard. It doesn't seem that you can complete the game. Also, what is effectively the hitbox for babies against the wall seems inconsistent or too small. Still, I had a bit of fun painting the wall as best as I could. It took 36 babies to paint the wall, and partially the floor, which is good to know as I'm actually doing my kitchen that color.